Axe is the most ancient tool or weapon created by the mankind. The basic function of the axe is to chop. The first axe did not have a haft. And was a molded stone. Gradual variations made it the most favored weapon. An axe has a strong and sturdy handle with a blade at its one end. It can be a single blade or a double blade. The blade and the shaft both were metal but the shaft could be a wooden pole. The shaft was preferred long so as to maintain maximum distance between the head of the axe and the holders hands. The earliest axes of the stome age were probably not even hafted. The hafted axe belong to the mesolithic and neolithic age when they were used to fell trees. These axe blade were made by grinding the stone. Brich tar, raw hides and antler sleeve were used for hafting. The battle or T axe were a status symbol. The medieval European axe was a favorite war weapon. The use of axes can be seen in the most ancient civilizations of The Egypt and India. The Axe is considered to be the weapon of Yamraj, the lord of death in Hindu Mythology. The axe was at one time a status symbol. Battle Axe : A battle-axe or a war axe is a generic name given to the fighting axe. These axes are bigger than normal axes. They are two handed and two headed. The blade size is also larger. The blades are highly sharpened this large size makes the weapon effective in slashing and chopping. Because of its size and weight greater skills were required to handle a fighting axe. These were common in Medieval Europe. These axes of war were very effective when it came to crushing the armor. A battle axe represents the roots of Indo European culture. Here the bronze age people are called battle axe people because of the importance of axe. It is of great importance in Amazonian Cultures. There were certain rituals carried on by the women with battle as the centre figure. The two heads of the battle axe represent the waxing and the waning moon. Throwing Axe : The throwing axe is narrower and lighter than the battle-axe. It had to be well balanced weapon. Most of the throwing axe are single headed. They can be used as a hand held weapon also. As a handheld weapon it was a deadly weapon. It could cut through the armors and shields. 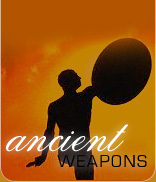 These axes when thrown could disrupt the opposition and allow the advance in a shield wall. 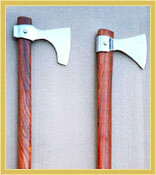 Viking axe and tomahawks are throwing axewith variations.